B . Kushartanti The Acquisition of Stylistic Variation by Jakarta Indonesian Children To become competent speakers in their community , children have to learn the grammatical rules and lexicon of one or more language varieties . In addition , they need to learn when to use these varieties and to adapt their speech to both topic and setting . 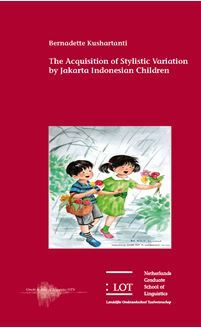 In the case of Indonesian , children in the capital , Jakarta , must cope with the use of different varieties of the language . The two varieties of Indonesian which these children need to acquire are Bahasa Indonesia ( the standard language ) and Colloquial Jakarta Indonesian . This study focuses on three to five year old , middle class children in Jakarta . Over a period of six months , the factors influencing the use of both varieties , the childrenâs ability to style shift in a formal and informal situation , and the acquisition of a number of morphological variables were examined . The research shows that children use more Bahasa Indonesia in formal than in informal situations , and more Colloquial Jakarta Indonesian in informal than formal situations . This indicates that they are linguistically sensitive to different situations at this early age . However , large individual differences were also observed . Further , the children acquire grammatical and social competence simultaneously , with the informal variety going ahead of the formal . This study will be of interest to researchers working on language acquisition , educational language policy , bilingualism , and language variation . It provides a better understanding of the language learning process by Indonesian preschoolers , which is an important aspect of language education , language planning and policy in Indonesia .